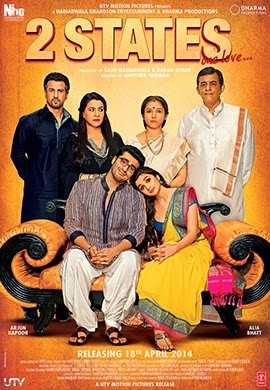 The movie is the adaptation of Chetan Bhagat’s National Bestseller book, 2 States. It is all about the desperate efforts of Krish (Arjun Kapoor) and Ananya (Alia Bhatt), who are deeply in love, to convince their parents to marry each other. The villain is neither parents nor circumstances, but their states – Krish is a Punjabi and Ananya is a Tamil Brahmin. Will their parents agree for their marriage? This forms the rest of the witty and easy-going movie, 2 States. To begin with, I am someone who had enjoyed 2 States (book) thoroughly. It was witty, full of love. Yet, it carried a certain level of maturity. So, I was totally excited to watch 2 States (movie). And I was not disappointed. Especially, the first half. The chemistry between the lead is sizzling and fresh. And the dialogs are witty, sarcastic and sometimes, clichéd; though always enjoyable. There are several laugh-aloud moments too. The songs fit into the right place. The entire film oozes with vibrant colors. What makes this movie different, entertaining and watchable is the plot per se. It is interesting and at the same time doesn’t bore you much. Alia as Ananya is cute, smart, bold and independent. She comes across as beauty with brains; a rarity in movies and so-common in real life! Her costumes are so wearable - Thanks to Manish Malhotra - and she looks adorable. Arjun as Krish has done his best as the scapegoat between his mother and lover. Amrita Singh as Arjun’s mother stands out in the crowd. She is really funny. However, I have to tell you that the second half was a little too dragging and seemed never ending. I wish that it was cut-short or the dosage of melodrama and silence was reduced. The movie is different and vibrant. A good paisa-vasool. iv. If you are a female, to secretly hope/wish that a Krish comes into your life…gives you all the possible love… and also is bold enough to let the world know about the love and marry you! You can choose iii. as your reason too..